A watershed is an area of land that drains into a particular watercourse or body of water. Newport Bay’s watershed is approximately 154 square miles in area and includes Irvine, Tustin and parts of Lake Forest, Santa Ana and Costa Mesa as well as unincorporated areas of Orange County. Storm water runoff from this watershed brings with it trash, and other less-obvious pollutants including bacteria and other pathogens, selenium, and sediment. 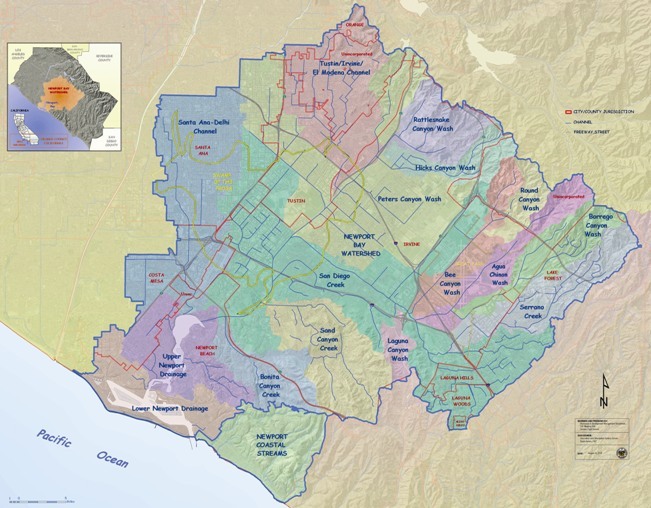 The Newport Bay Watershed has two main sub-watersheds – San Diego Creek which includes newer cities such as Irvine, and Delhi Channel which includes parts of older cities such as Santa Ana. Additional local drainages into the Bay make up the balance of the watershed. Find out how you can help to keep the Bay clean at the Clean Water Newport website. The Newport Bay Watershed is hydrologically separate from the Santa Ana River Watershed, though it is part of the Santa Ana River Watershed Management Area and does share a common aquifer with northern Orange County through which the Santa Ana River flows to the ocean. Withdrawal and replenishment throughout the entire aquifer is coordinated by the Orange County Water District (OCWD) which works closely with the various water retailers to provide integrated management of groundwater treatment and distribution. The Municipal Water District of Orange County (MWDOC) does likewise with respect to imported water supplies. Within the Newport Bay Watershed, Irvine Ranch Water District (IRWD) is the largest drinking water supplier. IRWD also provides sewage treatment and has installed an extensive reclaimed water distribution network. Water supply and demand is an important natural resource issue. The Newport Bay Watershed is an arid desert area with a population that now stands at about 700,000 and continues to grow as the San Diego Creek watershed achieves build-out. Extensive efforts continue to be directed at reducing water consumption, increasing reclamation and adopting integrated solutions to minimize dependence on water from the Colorado River and the Sacramento Delta.